Streamlined in every way, War of the Vikings cut too much meat from the bone and left nothing to chew on. There are few things as horrifying as a blood-covered Viking wielding an axe. The two Saxons closing in on me, though, aren't as intimidated as I'd like. The three of us are the only fighters left alive, and I'm feeling lucky. I lunge and swing my axe sidearm at the first man. My wild strike hits high and decapitates him. I hop forward and bring my axe down to crush the skull of the second, but he spins around me, and I'm overexposed, off-balance. He rams his sword in my gut. War of the Vikings, Fatshark's follow-up to 2012's War of the Roses, churns out little combat stories like my desperate two-on-one stand. The multiplayer melee combat arena, like a feudal Call of Duty, is built on these moments: the Vikings stream over the battlements, the ally avenges the fallen friend, the lone Saxon defends a chokepoint like a British Leonidas. It's unfortunate that the game's narrow scope and sloppy netcode stop so many other great stories from happening. Fatshark worked to streamline War of the Roses' many systems and frivolous mechanics, but now War of the Vikings has lost too much weight, and what's left doesn't run like it should. 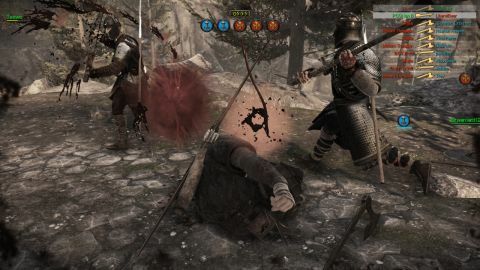 Vikings has been through a pre-release process with paid alpha and beta tests, but servers are still incapable of handling the demands of large melee battles. Once, an enemy swordsman and I found each other alone in a corner of the field: time for an old-fashioned, one on one brawl. Attacking each other, our swords swing and pass through our bodies without impact. My opponent and I pause a moment, looking a bit stupid. A second later the server updates and teleports the dirty Saxon a few yards away. It felt as though an omnipotent pacifist was telling us to chill out, turning our swords to wood and separating us with biblical flair. Moments like this one rob War of the Vikings of its most important asset: trust. Just like paper currency holds value only because consumers believe it does, an online multiplayer melee arena only works if its players believe it is fair and accurate, that sword blades and flesh exist where the game says they do. Server lag and hitbox problems undermine this essential belief. The next time I lose a fight, I'm not wondering how I can do better next time, I'm wondering if my opponent's proximity to the server doomed me from the beginning. Judging from the constant whining and cries of disbelief on the in-game chat, I'm not alone in my crisis of faith. Netcode aside, combat in Vikings is tighter, faster, and better than Roses. Characters in Vikings have more options for movement, including forward and sideways lunges for dodging and counter-attacking—a huge step up from the strafe-and-swing tactics used in Roses. The best new addition is a brutal special move for all primary weapons: at the expense of stamina and a long wind-up time, special moves offer a devastating strike that kills all but the most heavily armored opponents. Another big change is in how you execute wounded enemies. You can still execute downed players, but it will take you a moment to aim and stab. If you can't finish the job, their allies will help them to their feet and they'll be at the front lines without waiting to respawn. There's a risk/reward gamble at work here, and I love the organic feel of it. Roses' similar mechanic locked players into over-long execution animations, and the new system is a huge improvement. Roses' deep economy of unlockable weapons and upgradable blades and pommels is gone; in Vikings, every unlockable upgrade is cosmetic. There's a lot of merit to this: seniority no longer buys a competitive edge. When you see a figure cloaked in white and gold with a glittering broadsword set with rubies, you know that you're dealing with an expert—but that blade isn't any sharper than yours. However, an absence of a meta-economy leaves Vikings with a shortened lifespan. After only five hours of play, I unlocked all five weapons (sword, axe, two-handed axe, spear, and bow), every combat perk, and all four custom loadout slots. Without new weapons or perks to unlock, there are no new mechanics left to discover, no new ways to play the game to look forward to. I have two of my custom loadouts sitting blank because I can't think of a use for them. Viking's maps are gorgeous and well-designed, but there's nothing interesting to do on them. The game has only three modes: Arena (a single-spawn mode that plays like Counter-Strike with axes), Conquest (a capture-the-point mode), and Team Deathmatch. The lack of a town to pillage, buildings to burn, or loot to steal is a shocking oversight in a game dedicated to history's most infamous marauders. Players could be protecting fat, waddling monarchs or breaking down gates, or anything that isn't running face-first at the other guys as many times as we can. War of the Roses was able to recruit celebrated actor Brian Blessed to provide voiceover work, and I miss the dulcet tones of his kingly voice. In his place are a pair of voice actors, one for the Saxons and one for the Vikings, who warn you when your side is winning, losing, or time is running down. The Saxons' actor is male, sounding vaguely British and vaguely bored. The Vikings' announcer, by contrast, sets my teeth on edge with her constant abuse, like a Teutonic Cruella de Vil. Oh, Brian Blessed. Come back to us. With limited weapons, limited ways to play, and unreliable servers to play on, I can't recommend War of the Vikings over its two-year-old predecessor. Fatshark may refine the Vikings formula in time, but after such a lengthy testing phase populated by paying customers, I can't see any excuse why the game isn't ready on day one.